Edgar Rice Burroughs created one of the most iconic figures in American pop culture, Tarzan of the Apes, and it is impossible to overstate his influence on entire genres of popular literature in the decades after his enormously winning pulp novels stormed the public's imagination. 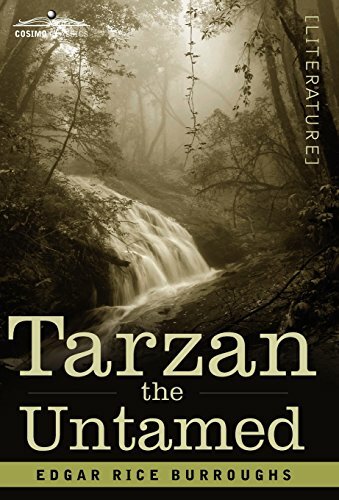 Tarzan the Untamed, first published in 1920, is the seventh book of Burroughs' tales of the ape-man. Here, Tarzan swears vengeance against the murderers of his wife as the conflagration of the Great War begins to burn a swathe through this corner of British East Africa. American novelist EDGAR RICE BURROUGHS (1875-1950) wrote dozens of adventure, crime, and science fiction novels that are still beloved today, including Tarzan of the Apes (1912), At the Earth's Core (1914), A Princess of Mars (1917), The Land That Time Forgot (1924), and Pirates of Venus (1934). He is reputed to have been reading a comic book when he died. This book is a standard print version using a minimum of 10 point type in a 6 by 9 inch size and library bound. As with all Quiet Vision print books, it use a high grade, acid free paper for long life.